Abram John (A. J.) Klassen: churchman, teacher and historian; born 12 April 1926 in Kamenez, Neu Samara Colony, Russia, to John C. and Elizabeth (Martens) Klassen. He was the third child in a family of eight children. On 23 August 1953 he married Betty Suderman. They had three daughters and one son. Abe died 15 July 2003 in Abbotsford, British Columbia. Within three months of his birth Abe Klassen moved to Canada with his parents and siblings, settling in Crowfoot, Alberta, then moving to Lindbrook some years later. In 1940, at age 14, he committed his life to Christ and was soon baptized in Hastings Lake by Peter Warkentin and received into the Lindbrook Mennonite Brethren Church. After Bible school at Coaldale, Alberta and high school at Prairie Bible Institute, he followed his family to Matsqui, British Columbia in 1948, attended Bethel Bible School for a year and then obtained a BC teaching credential at the Vancouver Normal School. He married Betty Suderman at the Matsqui Mennonite Brethren Church. After serving as youth leader at the church during his high school teaching career, Abe was drafted into the preaching ministry during the transition to bilingualism. He was in the pulpit almost every Sunday and felt the need to get further training. They moved to Goshen, Indiana where Abe found a mentor in H. S. Bender, and graduated from Goshen Biblical Seminary. He continued graduate studies at Wheaton Graduate School in the Chicago area and then returned in 1962 to British Columbia to teach at the Mennonite Brethren Bible Institute in Clearbrook. During these years he depended on his wife Betty for typing and editing his manuscripts. In 1965, J. B. Toews, needing a faculty person who could bring an Anabaptist spirit to the Mennonite Brethren Biblical Seminary (MBBS) in Fresno, California, invited Abe to teach there. While living in southern California and commuting to Fresno to teach some classes, he completed his doctoral studies at Claremont Graduate School and taught at MBBS for fourteen years. 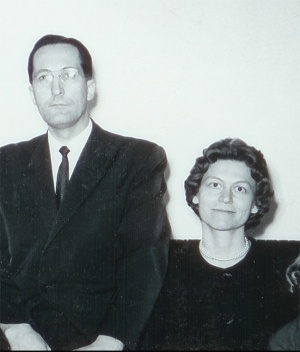 His doctoral dissertation was entitled “Discipleship in Anabaptism and Bonhoeffer.” Abe and Betty returned to Abbotsford in 1981 to pastor the King Road Mennonite Brethren Church. After this pastorate they went on several short-term mission assignments to Paraguay and India. Abe was a gifted storyteller with an amazing memory. His creativity, energy and varied interests moved him in a number of directions throughout his career as a pastor and educator. When not studying, teaching or pastoring, Abe edited and wrote many books on Mennonite history and Mennonite Brethren theology. Obituary. Mennonite Brethren Herald (24 October 2003): 25. Stobbe, Ben. "Klassen, Abram John (1926-2003)." Global Anabaptist Mennonite Encyclopedia Online. September 2004. Web. 24 Apr 2019. http://gameo.org/index.php?title=Klassen,_Abram_John_(1926-2003)&oldid=142958. Stobbe, Ben. (September 2004). Klassen, Abram John (1926-2003). Global Anabaptist Mennonite Encyclopedia Online. Retrieved 24 April 2019, from http://gameo.org/index.php?title=Klassen,_Abram_John_(1926-2003)&oldid=142958.